Welcome Michael, and thank you for being with us today! Why don’t you start by telling our readers a bit about your journey to becoming a published author? I am an orthopaedic surgeon and most of my career has been in academic medicine. That means that I travel and speak at a lot of medical conferences. The topics presented and discussed at these meetings deal with medical issues and new hip and knee replacement inventions are generally not included. Over the past five or six years it seems, I have been asked by some of the younger surgeons attending these meetings how to develop ideas for improvements in hip and knee replacement devices. When I responded to these questions I noticed that some of the non-medical people in the audience seemed very interested in the discussion, and I thought that maybe others would be interested in reading a book about it. What is The Joint Kitchen about? This book is a story about where ideas for inventions come from. It describes how wonderfully efficient the normal hip and knee joint really are, and why we can’t make hip and knee replacements as perfect as the normal joints we were born with. Then a doctor who found himself just cleaning the kitchen, preparing food, opening a wine bottle, unscrewing a jar top, riding a chairlift, fishing, skiing, or watching snowflakes fall drew similar images on a paper that turned into patents for new hip and knee replacements. The story suggests that when our mind is in a peaceful state of tranquility the creative and problem solving parts of our brain can magically connect and create a new idea. What inspired you to write The Joint Kitchen? I’ve helped develop a number of hip and knee replacement devices over the years. I really didn’t know why the ideas for these inventions sort of popped into my head, but I did know exactly where I was and what I was doing when a lot of them happened. It turned out that where I was and what I was doing were directly related to images that became new hip and knee replacement patents. I never really thought anyone would be interested in this, but every once in a while someone would ask me how I got all these ideas. When I responded with some simple examples, it seemed to make perfect sense to them. I think that this process happens to all of us on various levels, and hoped that by writing about my story it would inspire others to develop their ideas. Such a great title – obviously inspired by your revelations in the kitchen! How did every day kitchen/food items spark your ideas and when did you realize your kitchen was such a wealth of inspiration? I’m not much of a cook, but just wind up in the kitchen a lot of times usually to fix something quick and easy to eat for my kids or myself typically in the morning. It’s somewhat of a very peaceful and tranquil time even if what you need to do that day is in the back of your mind. It seems that that’s when ideas come to you – when you are not trying to think about one. The whole process of taking an ordinary orange and seeing its potential as part of new hip replacement procedure, creating and developing the idea through drawings, etc., requires great artistic expression. Tell us a bit about your artistic nature. Did you even consider yourself an artist? I really admire and respect artists. I don’t consider myself much of one, but I like to take photos mostly of landscapes or nature more than people. I’ve also sat through a lot of medical lectures, and when I see a slide full of words on it, my mind sort of glazes over, but when I see a simple diagram or image that makes sense, I get it. There are a lot of pictures in The Joint Kitchen. The subtitle of your book: “A Handbook for Orthopaedic Inventors and Fraidy Cats Facing a Knee or Hip Replacement” indicates the information is ideal for doctors, inventors and people in need of a knee or hip replacement. How does your book cater to such very different audiences? The book is about how ideas for inventions can be created, but since it specifically describes medical devices I think that health care professionals in the orthopaedic field would have a lot in common with the story. The Joint Kitchen also shows how the normal hip and knee work, and the differences between the normal joints and replaced joints. That is something that anyone considering a joint replacement, and maybe their friends and family usually want to know about. There is also a description of how our mind thinks by connecting images, which I believe is similar to what scientists and scholars who study the brain have found. I hope that those smart people can also find The Joint Kitchen useful to further understand how we create ideas. What was your biggest challenge writing The Joint Kitchen? Writing The Joint Kitchen was not too difficult – I just put images of what I was doing usually in the kitchen and the corresponding patent drawings side by side and they were pretty much the same. The biggest challenge was overcoming my fear that people wouldn’t like it. I guess most authors probably go through that, so for me the issue was whether or not to put it out there for everyone to see. What do you like to do when you aren’t working, inventing new medical breakthroughs and writing? I really treasure every moment I have with my family. We do a lot together like ski, hike, and spend time in the outdoors. Some of the best times for us have been travelling on RV trips to new destinations we have never been to before. My wife and kids also tolerate me going away for a week or so every year to take a back-country ski, golf or fishing trip with my friends. What is the best advice you’ve ever received, about writing, inventing, or about life in general? When I’m not sure if an idea is worthwhile to pursue the best advice I have always had is to go ahead and do it. That’s the only way you will find out. What advice do you have for aspiring authors and/or inventors? For inventors, that’s what the last two chapters in The Joint Kitchen are about. It describes a way to see if your idea works, protect it, and turn it into reality. A lot of books have been written about the nuts and bolts of how to file a patent and start a company or sell your idea, but mine is more of a story about how to figure out your own path forward. For writers, I might not be the best to to give advice, since I’m relatively new at it. There is a lot in common with publishing and inventing though, and the same challenges that inventors face also happen to writers. Not yet. I want to see how this one goes – so far so good it seems, but I do have some thoughts about another book. Writing for me is somewhat like getting an idea for a new invention – you just have to let it happen. So we’ll just have to wait and see. Where can readers connect with you on social media to learn more about The Joint Kitchen? I’m on Twitter, Facebook, and LinkedIn and an easy way to start is the author website www.michaelriesmd.com. What kind of information is available on your website? 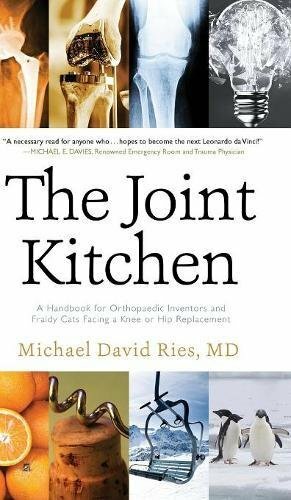 There is a description of the content in The Joint Kitchen with a great little video that shows what it’s about http://michaelriesmd.com/book/the-joint-kitchen/. There is also some information about me, links to my patents, and some recent book chapters and journal articles I’ve written. Writing and publishing a book was not anything I ever planned to do or anywhere on my bucket list, but I’m glad to have done it. I’ve had a lot of nice comments from people who have read it and I would highly recommend doing this for anyone considering telling their story to others.